Gru is fired from the Anti-Villain League for failing to apprehend super criminal Balthazar Bratt. Shortly after, he discovers he has a long-lost twin brother named Dru, who wants to get into the family business of villainy. "Despicable Me 3" is actually the fourth film in the "Despicable Me" franchise, which includes the "Minions" spin-off/prequel. It is from Illumination Studios, which has made other projects like "The Secret Life of Pets" and "Sing." 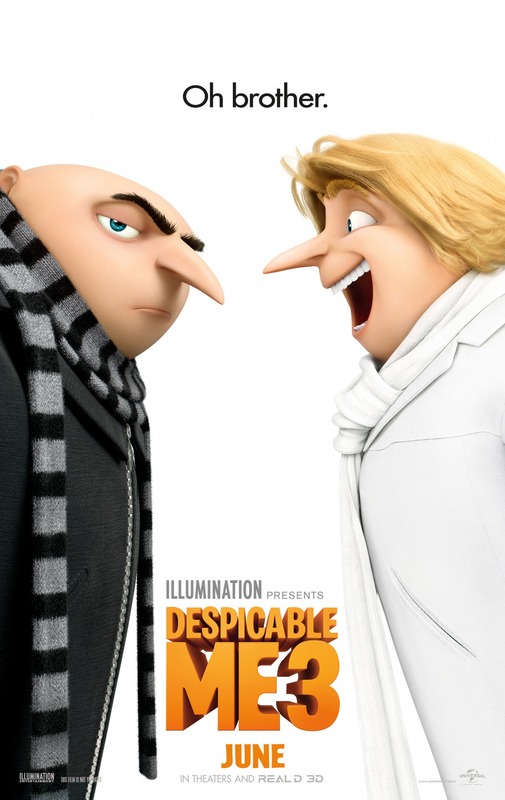 Steve Carell returns as the voice of Gru, but he also pulls double duty as Gru's long lost twin brother Dru. Also returning are Kristen Wiig as Gru's wife and partner in crime fighting Lucy, and Miranda Cosgrove and Dana Gaier as their daughters Margo and Edith. A new young actress named Nev Scharrel takes over the voice of the couple's youngest daughter Agnes. Also new to the series is the hilarious Trey Parker, who voices the villainous Balthazar Bratt, a former child star perpetually stuck in the 80's. There is a lot going on in "Despicable Me 3," so we will try to explain it as best we can through each of its various subplots. The main villain of this third installment is, as we mentioned above, the 80's-obsessed Bratt, who was fired from his very popular TV show when he hit puberty. Still stuck in that decade and unable to let the sting of his years-old firing go, Bratt wants to steal a big pink diamond. Gru and Lucy try to stop him, and though they recover said diamond, Bratt moonwalks away. This gets Gru fired, which in turn gets Lucy fired for trying to defend him. A short time later, Gru is told his parents "Parent Trapped" him when he was a child and that he actually has a long lost twin brother named Dru. Dru has been living with their now deceased father in Freedonia his entire life. The two brothers finally meet, and Dru asks Gru to help him successfully get into the family business of super villainy. Gru agrees but has ulterior motives as to why. Meanwhile, the Minions have their own little adventure in what should have been a completely separate movie. Their subplot lands them on an "America's Got Talent"-like TV show and eventually in prison where they rule the roost in "West Side Story" style. While Dru and Gru are doing their villainy and bonding thing, Lucy is trying to figure out what this whole pesky motherhood thing is all about, while Agnes goes off to the Crooked Forest on a quest to look for a real unicorn. All of this happens while Balthazar Bratt is hatching an "Age of Ultron"-esque evil scheme that will carry an entire city into space. Did we mention there is A LOT going on in this movie?! Clearly, one of the biggest problems with "Despicable Me 3" is its lack of focus. It wants to showcase the series' most popular characters, the Minions and Agnes, above all else. At the same time, they have to give Gru and company enough to do in order to call it "Despicable Me 3" rather than "Minions 1.5" or even "Agnes's Unicorn Hunting Adventure." That being said, there is still enough good stuff in this film to keep adults sane while their kids go wild for the Minions, the flashy colors, and the unique, goofy gadgets. There are quite a few funny moments, though the sentiments about family and love feel much more shoehorned in than they have in the past. Steve Carell delivers some excellent lines, and Trey Parker can be very funny as Bratt. Balthazar's whole shtick is humorous because of how ridiculous the 80's were with its Betamax tapes, its shoulder pads, and its mullets. Of course, the film's target audience was born in the mid-2000's, so many of the kids who watch this movie will probably not understand these jokes due to generational differences. Hey, at least it was nice enough to consider the parents in the crowd. Kids will dig the Minions and not care about anything else so they won't be disappointed. We do feel compelled to note that our crowd was far less enthralled with this particular movie than the previous two, judging by audience reaction alone. "Despicable Me 3" is certainly not as strong as the original film, or even the sequel for that matter, but it did make us chuckle multiple times and wraps up in a decent way. There is nothing offensively bad about this picture, but it isn't that great either. We wound up bored enough on a few occasions to glance at our watches, which is terrible for a movie that is only 90 minutes long. The Minions are the stars of the show now, so it begs the question, is there a place for Grucy and their kids moving forward? Only time will tell.